Millennials are the fastest growing population in the work place. More millennials in the work place mean more millennials in the marketplace. Many businesses have revamped their business models, marketing and services based on what appeals to this generation. For many millennial attorneys, the first step in transitioning from the classroom to the courtroom begins with opening their own law firm followed by buying malpractice insurance. Lawyers Mutual gets it! We understand how intimidating purchasing malpractice insurance can be, which is why we begin cultivating relationships with law students before they ever step foot in a courtroom. Lawyers Mutual has been around since 1977. Over the years we have found ways to become more efficient in our business through integrating new processes and keeping up with today’s ever-changing technology. However, one thing that has remained the same is our dedication to our people. We are a proud to be a bar related insurance company. We believe it’s our relationships and our people that appeal to the collaborative mindset of millennials who have mastered networking both in person and online. We are dedicated to personal service, quality coverage and the satisfaction of our insureds. It’s our people (employees and insureds) and relationships that are our most valued asset. For this reason, we have launched our community boards which allows us to connect with our insureds in a new way. Lawyers Mutual begins providing value to law students while they are pursuing their law degree. We offer programs that are tailored to law students such as: “Communication Skills for Millennials, How to Start and Build a Law Practice and Strategic Networking. We have also launched a virtual Student Resource Center (SRC) that’s devoted to sharing information that is relevant to law students. As part of our Student Resource Center, every Friday our Byte of Prevention blog is dedicated to law students with our “SRC Friday” posts. Lawyers Mutual is also a proud participant of the North Carolina Bar Association Minorities in the Profession Summer Associate Program. We are dedicated to serving the legal community, and that begins with investing in the future of the profession. Lawyers Mutual is locally owned and operated which means not only are we more accessible, but more knowledgeable about the legal community we serve. Our claims attorneys and staff are deeply involved in the legal community—serving on boards, speaking at industry events and active members of various legal associations. We are able to keep our finger on the pulse of the North Carolina legal community because we are fully immersed in what’s going on. 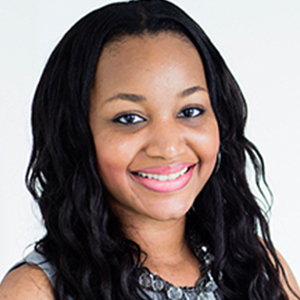 Millennials are a generation that’s devoted to professional development and growth. In navigating their careers, millennial lawyers will likely be taking the career “lattice” instead of the traditional “ladder.” Lawyers Mutual provides insureds with tools they can use to grow in the profession. We offer annual CLE seminars at no charge to our insureds. In addition, to our annual CLE programs, we launched our Succession Planning series in 2014 and have added a Cyber CLE program this year as well. We create programs that solve today’s problems and we discuss what matters most to our insureds. Lawyers Mutual realizes the importance of being where our constituents are whether it’s in the classroom or on social media. We love sharing information and engaging with our insureds on social media. This platform has also given us an additional opportunity to share our newsletter and malpractice alerts. Lawyers Mutual understands that millennials are on-the-go and we’re always looking for ways to accommodate our insureds and create mobile friendly platforms for our resources. 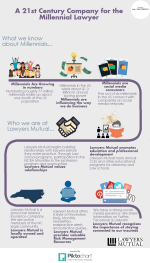 Lawyers Mutual understands the independent nature of the millennial lawyer. Our website is packed with valuable risk management resources that allow attorneys to access information quickly and at their own convenience. Our practice guide offerings includes: Virtual Law Practice, Opening a Law Firm Toolkit, Of Counsel Agreements and much more! We also have a lending library that allows insureds to check out books on a wide range of topics. We’ve found this to be a very valuable resource to our new attorneys. Our book selection includes: 100+ Pointers for New Lawyers on adjusting to Your Job by Sharon Meit Abrahams EdD, How to Start and Build a Law Practice by Jay Foonberg, The Lawyers Guide to Record Management and Retention by George Cunningham and John C. Montana and a myriad of other titles. We seek to grow with attorneys from the beginning of their careers—we’re there from swearing in to succession planning. The relationships we build with our insureds and other professionals in the legal community makes the difference, allowing us to be a 21st century partner for millennial lawyers.